Shows us a child toddler or baby who doesn’t love CBeebies Mr Tumble and we would be very surprised indeed! – From the hit CBeebies television show comes Mr Tumble the lovable character brought to life by Justin Fletcher, and from that comes this beautiful new shoulder bag based on the design used in the tv show. Mr Tumbles spotty bag is designed to be worn by and loved by children, and is made from brightly coloured fabric with an adjustable shoulder strap, multicoloured spots and the Something Special logo. 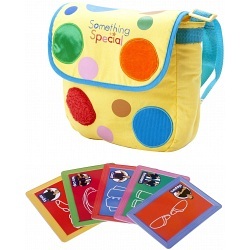 This delightful bag also comes complete with 5 x finder cards with Makaton signs so your little one can play along just like Mr Tumble. We road tested this excellent bag with Sarah and Marshall. Read their thoughts on our website here. 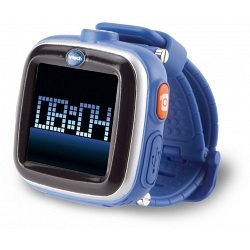 Topping the most wanted list this Christmas is the delightful new KidiZoom Smart Watch from VTech. Released in September 2014, this has been a constant best selling product and we are sure will continue to do so throughout the festive period. Available in either Blue, Pink and White; this marvel of electronics is sure to give your child the WOW factor when they open the package on Christmas day. The first of it’s kind in the childrens smart watch market, and one which has certainly set the bar high for others to follow. With the VTech KidiZoom Smart Watch your child can take photos and edit them, capture videos and watch them via the in built video playback functions. They can also display the time (obviously) but in either analogue or digital format with different clock faces. They can set alarms, play games, use the stop watch function and even record their own voice. Aimed at children 5-12 years of age, this amazing electronic smart watch will put a smile on the face of any budding spy or secret agent. Read what our roving reporter Lucy had to say about the new Smart Watch from KidiZoom and VTech on our website here. Find the full product details for the LEGO Minecraft The First Night 21115 set on our website here. So after what seems like a lifetimes wait, the wait is finally now over and the brilliant new LEGO Minecraft sets are here and available. The first set to go under the watchful eye of our reviewer Lucy is the LEGO Minecraft The First Night 21115 set. The first night set comprises of lot’s of 2×2 LEGO bricks in a variety of different colours (Browns and Greens mainly) and includes the 3 excellent new LEGO minifigures or minifigs in the styles of Steve, a Creeper and a Pink pig. The set is titled the first night as it borrows from the game in which on your first night the first thing you should do is to learn how to build a shelter. This set is primarily aimed at building said shelter, hut or mini house. The really cool thing about the LEGO Minecraft the first night set is that the house actually pivots and opens up so that you can play with Steve and move him in and around the inside of the shelter. In addition to the house the set features a tree, grassed area and a small farm yard for our little Pink coloured piggy to roam around in. A lot has been said about the expensive nature of the new LEGO Minecraft sets, mainly because the blocks used are for the most part fairly standard LEGO fair and blocks that most people already own. What I would say is that although this is true, sometimes less is better to allow greater creativity. When you limit yourself to only using the contents of the LEGO Minecraft the first night set, or combine this with only other LEGO Minecraft sets then you will find yourself being very creative indeed. Also because of the limited colour range, what ever you build will always look like it has come straight out of the Minecraft world, and will somehow fit together better than a lot of random coloured LEGO bricks. The best part of these new sets is when you combine them together and can build a massive entire Minecraft world. 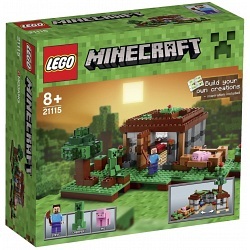 All in all we truly love the new Minecraft sets from LEGO and hope they continue to expand the range. The mini figs are also simply delightful and I am guessing will become highly collectible pieces in the future. If you are looking to purchase the LEGO 21115 Minecraft the first night set as a Christmas present then we suggest you do so quickly as they are already selling out fast. Thanks to our reviewer Lucy for the text and please see our website here for more information on where to buy your set from. 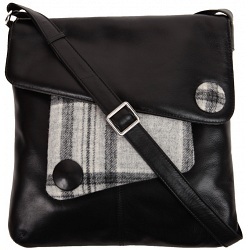 Abertweed leather shoulder bag, part of the Mala Leather Abertweed collection. Read our full description of the Abertweed large shoulder bag from Mala Leather on the Kubi website here. A new addition now for the Abertweed range from Mala Leather. This beautiful new leather across body bag is available in the previous seasons 3 colourways Red Purple and Magenta and this seasons newest colour Grey (or Grey / Black). The Mala Leather Abertweed Across Body Bag is available from today. Mala Leather Abertweed leather across body bag, part of the Mala Leather Abertweed collection. Want to know more about the latest leather across body bag from Mala Leather, then read our full description here. So you have brought a swish new Apple iPad Mini or iPad Mini Retina or even a Kindle Fire HD and now you need somewhere nice to store the thing when on the move. We think we may have the perfect solution. 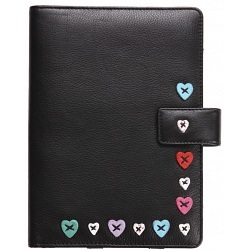 We sent Sally-Ann out to road test the new iPad Mini holder from Mala Leather and this is what she had to say. Mala Leather Lucy mini tablet holder new for Autumn / Winter 2013. Part of the Mala Leather Lucy collection. Suitable for holding the iPad mini, Kindle Fire HD, and some Nexus models. Please check the dimensions below will fit your tablet computer before ordering. Read our full review of the Mala Leather iPad Mini / iPad Mini Retina / Kindle Fire HD holder on our website today. Do you have a best friend? Do you want to show your best friend that you really love them? – Are you looking for a unique and unusual gift or presents idea for them for their birthday or Christmas? 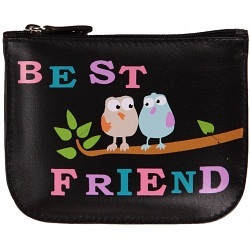 -Well look no further as we have the perfect answer; the Mala Leather Pinky Best Friend leather coin purse. Mala Leather Best Friend zip top coin purse, part of the Mala Leather Pinky collection. Read our full review of the Mala Leather best friend coin purse here. 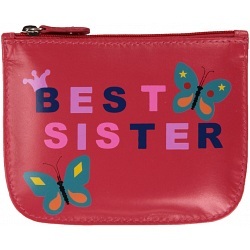 If you are looking for the perfect birthday gift or Christmas present idea this year for your sister then look no further than the beautiful Mala Leather Best Sister leather coin purse. Mala Leather Best Sister zip top coin purse, part of the Mala Leather Pinky collection. Where can I find an unusual gift for my sister? – that’s a question we rarely get asked, but if we did then we would point you at the fantastic Mala Leather Best Sister leather coin purse on our website. 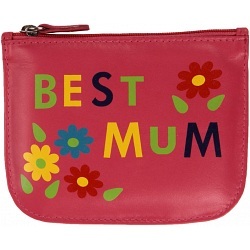 For those who truly appreciate their mums mum mothers or mummys; show them exactly how much you do love them with this beautiful token in the form of a lovely zip top leather coin purse with Best Mum print. Mala Leather Best Mum zip top coin purse, part of the Mala Leather Pinky collection. Read our review of the excellent best mum leather coin purse only on the Kubi website here. Read our full review of this beautiful patent leather shoulder bag from Mala Leather on our website. Mala Leather Allure patent leather shoulder bag new for Autumn / Winter 2013. Part of the Mala Leather Allure collection. 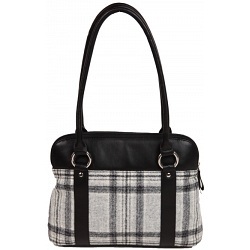 The perfect leather shoulder bag for this seasons hottest office or work Christmas parties. Where can I buy patent leather shoulder bags in Black or Red? – That’s a question we get asked a lot and to answer this question we direct people to this page on our website.